I stopped into Joanne’s just to get some thread and I had to walk by the fat quarters. Normally I get all my fabric at the local quilting store, they tend to have nicer fabrics but I couldn’t pass these up. Not that I actually needed them. I’ve already made a dress for my Soom Teenie Gem out of the first two colors on the left. I’ll post pics of what I’ve been sewing as soon as I have a wig for her, she looks a little strange bald. I have been cleaning one room for two days and I’m not quite done yet. You know that extra bedroom that becomes a catch all for anything you don’t know what to do with for the moment. It hasn’t been cleaned since last summer, there’s just no time during the school year. I just felt that I needed to do it now, every time I walked by it I just got depressed and then couldn’t accomplish anything else. Well now you can see the floor! You can actually walk into the closet and I can see the surface of my work table. I haven’t got to my computer desk or the file cabinet yet but I can finish that tomorrow. Four bags of trash and I feel good. 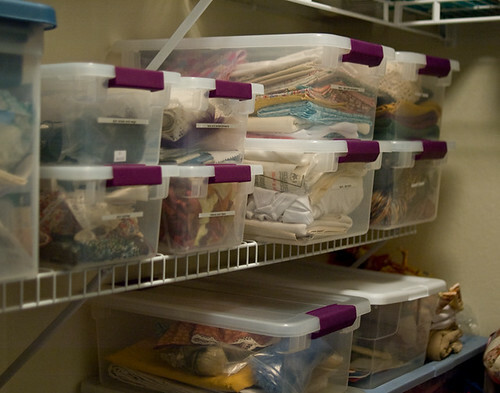 Here’s a pic of my re-organized closet and the bins of doll fabric and supplies. I don’t know how it happened but I’m currently waiting on a Soom MD Syen. I love her little vampire teeth and the gargoyle feet and the little wings. I’m not sure about the horns or the hands but we’ll see when she gets here. Ordering this girl means I get two heads so of course I had to find another Soom Teenie Gem body to buy for the extra head, not an easy thing to do. I ended up getting an Ai (body, open eyed head, and tail) and then I purchased some Beyla hooves because I’ve always liked the hooved dolls. I sold the tail but I still have an extra head, I’m not sure if I’ll keep the Ai head or use the Syen head. Maybe I’ll see sometime in August, I hate waiting. I love the hooves! Now just waiting for wigs. I love teaching but it is mentally and emotionally exhausting work. While you are in class you belong to everyone but yourself, if that makes any sense? I’m lucky that I teach really good kids, about a third of them are gifted, but they are demanding and very needy. You just need a break. I’ll spend the summer planning for next year but this year I hope to do some artwork as well. 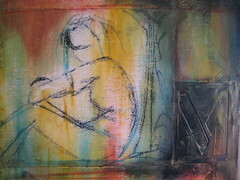 Last summer it was all about the new puppy so no time for artwork. I’m also hoping to do some sewing, I’ve got a Soom MD Syen on the way and I picked up a Soom Ai on the MP. I’m not sure that I’ll use the Ai head or the extra Syen head yet but I really like the Soom Teenie Gem body. I wasn’t sure I would like it compared to the Littlefee but I think its prettier.